Tag line: "Navajo revenge slashes ...burns ...ravages the screen!" It’s funny how time can affect your perception of a film. 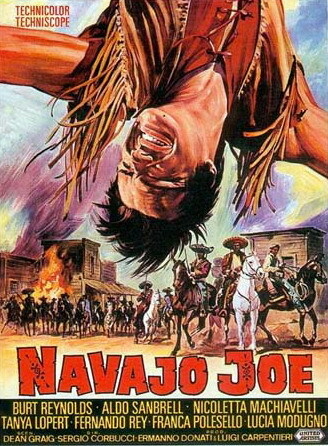 I first watched Navajo Joe decades ago, and thought it was a decent, if underwhelming western. Seeing it again today, I was blown away by its action scenes, and absolutely loved Ennio Morricone’s score (I even went on iTunes and downloaded the title song). It’s a thrilling, dramatic Italian western from director Sergio Corbucci, and I’m damn glad I decided to give it another chance. A band of outlaws, led by the ruthless half-breed Duncan (Aldo Sambrell), roams the west, slaughtering every Native American tribe they encounter, then selling their scalps to the highest bidder. But Duncan and his cohorts, which includes his half-brother Jeffrey (Lucio Rosato), have a chance to make some real money when Dr. Chester Lynne (Pierre Cressoy) proposes a scheme. Married to Hannah (Valeria Sabel), the daughter of the banker in the town of Esperenza, Dr. Lynne tells Duncan that a train carrying $500,000 is due to arrive the next day, and if the outlaw and his gang can steal the safe, the good doctor (who knows the combination) will open it and split the loot with them. Only one thing stands in their way: a pesky Navajo named Joe (Burt Reynolds), who has been tracking Duncan for hundreds of miles, picking off his men at a regular clip. When he hears of the scheme, Joe offers his services to the citizens of Esperenza, promising to keep the money safe and, if necessary, kill every single bandit that enters their town. But seeing as Duncan has about 50 men at his disposal, eliminating them all may be more than even a skilled Navajo can handle. From its opening moments, when Duncan and his gang massacre an entire Native American village (including women and children), to its final shoot-out, Navajo Joe is an action-packed western that moves along at an energetic pace. The movie is chock full of highlights; there’s a frantic chase in which Duncan’s men are hot on the trail of a covered wagon carrying three dancing girls (Lucia Modungo, Tanya Lopert and Franca Polesello), one of whom saw Dr. Lynne’s face (and can therefore identify him to the authorities). Even more exciting is the train robbery itself, where the bandits battle a detachment of cavalry troops and a handful of passengers, all of whom are armed and ready to fight. As for the performances, Burt Reynolds is fine as the usually-quiet title character, and the stunning Nicoletta Machiavelli has a brief but memorable role as a servant who develops a crush on Joe (thankfully, the film doesn’t spend any time building an actual romance between the two). The best of the lot, though, is Aldo Sambrell as Duncan, a half-breed who, because he was mistreated at an early age, hates whites and Native Americans and takes his anger out on them both every chance he gets (while robbing the train, he shoots a Swedish immigrant, played by Dyanik Zurakowska, in the back, then tells his men to dispose of her baby). As movie villains go, Duncan is downright unforgettable. Corbucci directed Navajo Joe the same year he made Django, another great western, and like that movie, Navajo Joe is an often-violent, occasionally gorgeous motion picture (shot in Spain, cinematographer Silvano Ippoliti perfectly captures the area’s natural beauty), and why I didn’t notice how good it was when I first saw it is a mystery. But, hey, better late than never, right? I love the film, Corbucci said he was inspired by Samurai Films (landscapes, close ups of flowers). Corbucci made this and the equally great The Hellbenders to satisfy contract obligations, which makes the film even more amazing. Of course his later westerns like Great Silence, The Specialist and Companero's are better, but Navajo Joe serves as a really good forerunner to what was to come .